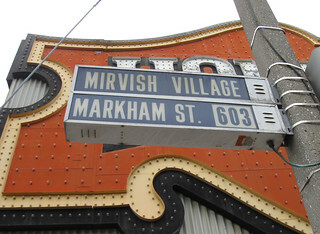 The Mirvish Village and Markham Street signs at Bloor are two of the only 1967-era back-lit colour-coordinated street signs left in Toronto. Blue signs represented north-south streets, yellow signs represented east-west. That particular Queen Street West sign is the only yellow one I know of.